A federal court judge has ruled in favor of the US Federal Trade Commission in its three-year-old deceptive practices lawsuit against Lights of America Inc. The legal news site Law360 has the story; free registration is required. The initial complaint dates from 2010, when LOA sold LED light bulbs to retailers and claimed that they would last 30,000 hours. In fact, a bulb was tested to exhibit an L20 (yes, you read that right) of 1,000 hours. That is, the bulb lost 80 percent of its luminance over a lifetime equivalent to that of a low-cost incandescent (as reported by LEDs Magazine in 2010). Bulbs that were advertised as suitable replacements for a 45-Watt incandescent were measured at 1/9 the lumen output of those they were intended to replace. 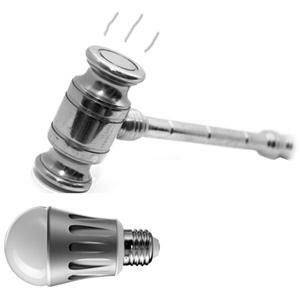 (LOA said in court that "suitable replacement" only meant that their bulbs screwed into the same socket.) The FTC alleged that LOA knew of evidence that belied the lifetime and light-output claims. The court determined that LOA profited in the amount of $21,165,863.47 as a result of the deceptive claims, and found the company and its two principals "jointly and severally liable" in that amount. The court also found that the FTC is entitled to injunctive relief, and ordered the agency to submit a proposal outlining its desired permanent injunction. Attorneys for LOA told Law360 that they plan to appeal the decision to the Ninth Circuit. Separately, LOA faces a consolidated class action from consumers on similar grounds; it was filed in 2011 and will be heard in the same court next month. In the early days, when LED lighting was first marketed to consumers for home use, exaggerated (and false) claims like those of LOA were not uncommon. Standards to characterize and compare LED lumen maintenance or output weren't in widespread use; consumer awareness was low and public educational programs had not yet begun. In fact, the development of programs such as Lighting Facts (under the Department of Energy but administered by the FTC) was hastened by this and similar complaints about early LED products. And today, standards such as LM-79 and LM-80, which actually predated 2010, are in almost universal use. The law grinds exceedingly slowly. Three years have gone by since the initial filing, and probably more like four since the FTC began to take notice of consumer complaints. The industry has been a rocket to the judiciary's snail. It is almost inconceivable to me that a company would make such false claims today in its advertising and packaging. Certainly no reputable company would, and consumers have been hearing for a while now that it pays to buy their LEDs from companies whose brands they know and trust. Still, you can find plenty of no-name LED lighting products with an Internet search, and national outlets such as Lowes and Home Depot do not carry only name brands. Companies headquartered offshore may calculate that they have less to fear from US government watchdogs. What do you think? Are US consumers likely to encounter another Lights of America?